Compatible with our EcoPure ECOP30 system, these replacement filters are stages one and three in the reverse osmosis filtration process. Made using a high-quality activated carbon block, the ECOROF filters feature a highly adsorptive, positively-charged material that removes greater amounts of impurities from your water than you would get with a sediment filter. Their encapsulated filter design feature means filter changes are quick and mess-free. No tools. No need to shut off water supply. No touching dirty filters. For best filtration results, please replace your ECOROF filters every six months, as recommended. Compatible with our EcoPure ECOP30 system, this replacement membrane is stage two in the reverse osmosis filtration process. 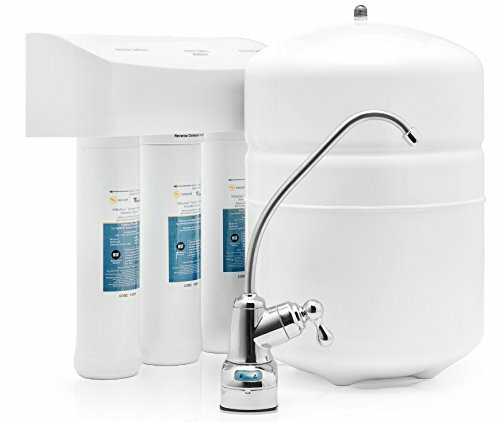 Made using a high-quality polyamide composite material, the ECOROM membrane features a semi-permeable barrier that filters large amounts of impurities from your water, due to its extremely low micron rating. Their encapsulated filter design feature means filter changes are quick and mess-free. No tools. No need to shut off water supply. No touching dirty filters. For best filtration results, please replace your ECOROM membrane every 1-3-years, as recommended. 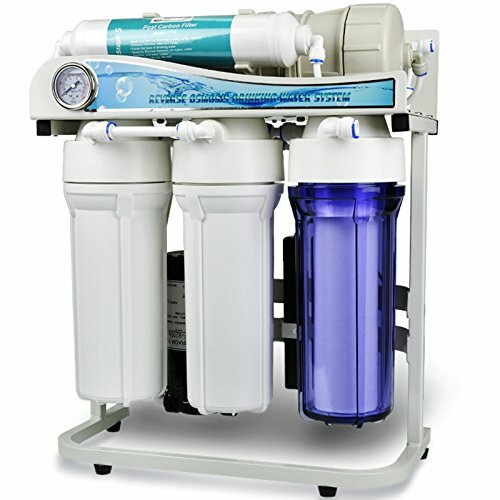 ISPRING RCC7AK is an upgraded model of our most popular under sink Reverse Osmosis system RCC7. It features the 6th alkaline stage, which restores alkalinity by adding a small amount (30 mg/Gal.) of calcium and magnesium back into the water. The pH value typically will be around 7 to 8 depending on source water hardness. It bears the WQA GOLD SEAL, the independent third-party test against NSF standard 58 (for RO system) which certifies that the product is safe, reliable, durable and capable of meeting the claims. It is designed to be user friendly and easy to install (search ISPRING RO installation video). The clear housing in the 1st stage enables visual inspection of filter condition. 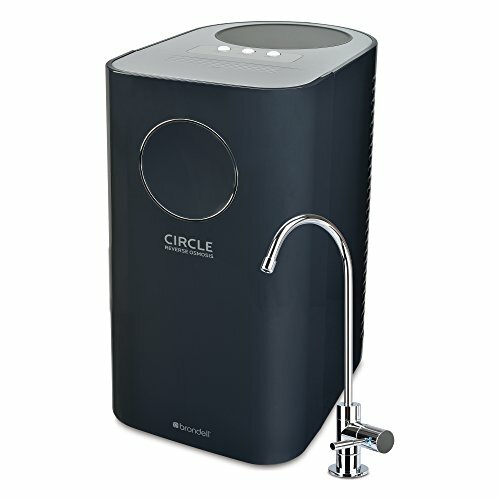 Featuring 0.0001 micron TFC RO and 5 stages of filtration, it is capable of removing 97.2% (WQA tested) of Total Dissolved Solids in the water, including chlorine, fluoride, arsenic, lead, chromium and radon, providing you endless Mineral Water right from the beautiful faucet that shines your kitchen. Protect your home, health, and appliances by filtering your water. The Express Water Sediment Water Filter removes major sediment contaminants from your water and provides clean water all home uses. This filter removes sediment contaminants like Rust, Dirt, Sand, Silt, Dust, and Scale. The Sediment filter is good for up to 6 months. This is based on average water quality. Your filter life may be different depending on your water quality, temperature, and incoming pressure. This durable filter is able to deliver up to 1 gallon of water per minute. The filter works with 45-80 psi and water temperatures between 40-100℉. The filter is vacuum sealed and 100% pure food-grade polypropylene complete with density layering and pleated design. Filter your water with high quality polypropylene for maximum sediment retention. Choose the filter that lasts longer to give you the best value in filtration: The Express Water Sediment Filter FLTSED0501 is the best in sediment filtration. Protect your home, health, and appliances by filtering your water. The Express Water Post Activated Carbon (PAC) Filter removes major contaminants from your water supply and provides clean water for drinking, showering, cooking, and other home uses. The PAC is the last step of filtration and improves the taste of your water just before you drink it. The PAC removes major water contaminants like Chlorine, Total Organic Carbon (TOC), Pharmaceuticals, Turbidity, Volatile Organic Chemicals (VOC), Herbicides, Industrial Solvents, Insecticides, Pesticides, and Chemicals causing bad tastes, odors, and more. The PAC filter is good for up to 1 year. This is based on average water quality. Your filter life may be different depending on your water quality, temperature, and incoming pressure. This durable, heavy-duty house inline filter is able to deliver up to 1 gallon per minute of water. The filter works with 45-80 psi and water temperatures between 40-100℉. The filter is vacuum sealed and complete with a polypropylene shell, a thermal bonded cap, and industrial sealed quick connect compatible outlets. Filter your water with high quality coconut carbon for maximum chemical absorption. Choose the filter that lasts longer to give you the best value in filtration. The Express Water Post Activated Carbon Filter FLTIN01PKQ is the best in carbon filtration. Protect your home, health, and appliances by filtering your water. The Express Water Activated Carbon Block Filter removes major contaminants from your water and provides clean water for home uses. The ACB removes major water contaminants like Chlorine, Total Organic Carbon (TOC), Pharmaceuticals, Turbidity, Volatile Organic Chemicals (VOC), Herbicides, Industrial Solvents, Insecticides, Pesticides, and Chemicals causing bad tastes, odors, and more. The ACB filter is good for up to 6 months. This is based on average water quality. Your filter life may be different depending on your water quality, temperature, and incoming pressure. This durable home water filter is able to deliver up to 1 gallon of water per minute. The filter works with 45-80 psi and water temperatures between 40-100℉. The filter is vacuum sealed and complete with a polypropylene shell, a thermal bonded cap, and an industrial sealed silicon ring to make sure it’s durable and reliable. Filter your water with high quality coconut carbon for maximum chemical absorption. Choose the filter that lasts longer to give you the best value in filtration. The Express Water Activated Carbon Block Filter FLTCAR0501C is the best in carbon filtration. Protect your home, health, and appliances by filtering your water. The Express Water Granular Activated Carbon Filter removes major contaminants from your water supply and provides clean water for drinking, showering, cooking, and other home uses. The GAC removes major water contaminants like Chlorine, Total Organic Carbon (TOC), Pharmaceuticals, Turbidity, Volatile Organic Chemicals (VOC), Herbicides, Industrial Solvents, Insecticides, Pesticides, and Chemicals causing bad tastes, odors, and more. The GAC filter is good for up to 6 months. This is based on average water quality. Your filter life may be different depending on your water quality, temperature, and incoming pressure. This durable, heavy-duty house filter is able to deliver up to 1 gallon per minute of water. The filter works with 45-80 psi and water temperatures between 40-100℉. The filter is vacuum sealed and complete with a polypropylene shell, a thermal bonded cap, and an industrial sealed silicon ring to make sure it’s durable and reliable. Filter your water with high quality coconut carbon for maximum chemical absorption. Choose the filter that lasts longer to give you the best value in filtration. The Express Water Granular Activated Carbon Filter FLTGAC0501 is the best in carbon filtration. 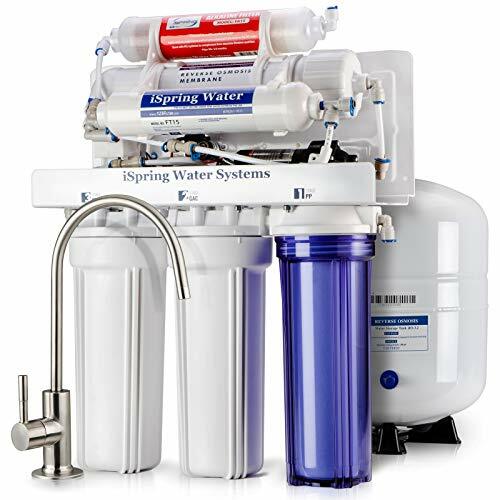 When looking for the finest drinking water available, right in your home, look no further than the iSpring RCC7. 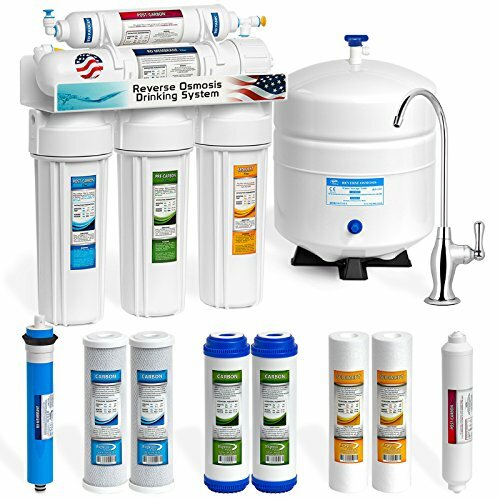 This economical, 5-stage, Reverse Osmosis-based filtration systems and point-of-use water softener removes virtually all contaminants from your drinking water, leaving you with pure, clear, clean, great-tasting water and nothing else! 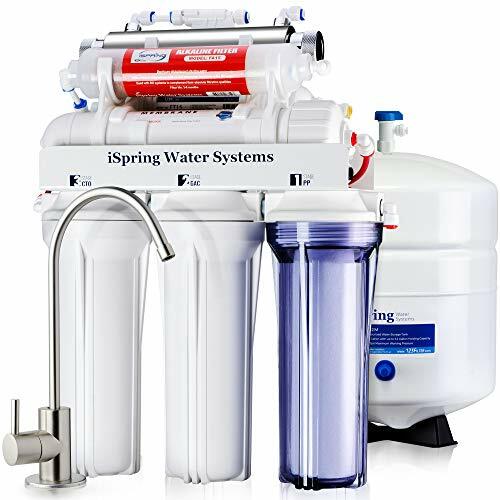 Backed by superior iSpring quality and customer service, here is a system that will give you many years of trouble-free, low maintenance peace of mind. 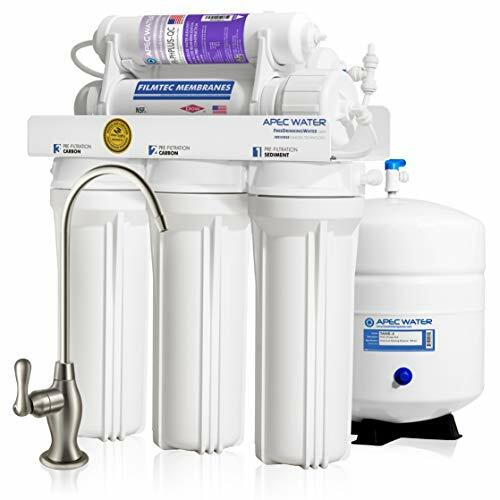 The RCC7 is a multi-layered filter system that provides optimal protection against over 1,000 different types of contaminants, including arsenic, asbestos, chlorine, hormones, fluoride, lead, mercury, sodium, bacteria, giardia, viruses and more. The system consists of 5 different stages, each one designed to progressively remove contaminants and improve water quality: 3 Pre-filters: - Polypropylene (PP) sediment filter. - Granular activated charcoal (GAC) filter. - Carbon block (CTO) filter. These three pre-filters remove large contaminants and protect the RO membrane from chemicals like chlorine and chloramines. - The heart of the system is the state-of-the art Reverse Osmosis (RO) filter that removes contaminants down to 0.0001 microns – so small that only water molecules can squeeze through but virtually nothing else. - Fine GAC final filter provides final polishing before the purified water is delivered to the faucet. The end result is bottled-water quality, with no 'hardness' and no sodium. The high-throughput RCC7 membrane is rated for up to 75 gallons per day (GPD), ensuring that families of nearly any size will have plenty of clean drinking water available on demand. Make the purest drinking water with your own home system. Great in the kitchen: Improve the taste of your cooking, coffee, ice, and drinks. Experience true UV Reverse Osmosis purification and sterilization. Safe filtered fresh tasting H2O: Removes up to 99.99% of contaminants including Lead, Chlorine, Fluoride, Cyanide, Giardia, Radium, Asbestos, Calcite, Heavy Metal, Bacteria, Viruses, Pharmaceuticals, and other major contaminants.Get setup fast with our Quick Connect tubing system. The UV light is equipped with a warning alarm that will alert you when the power of the UV falls below the germicidal range. Includes fast flow faucet with 0.8 GPM delivery.A compact system made to fit under counter in a cabinet. Best for house, apartment, residential, well water, industrial, rv, machine, and office uses. Certified by an independent laboratory to NSF standard 58. UV-C Ultraviolet light kills viruses, organisms, and bacteria in your water.Comes with 4 gallon (3.2 gallon water capacity) storage tank and tank stand. Includes all filters needed for setup and first 6 months of use. Can be wall / cabinet mounted or freestanding, made for indoor use. Can be installed undersink, in a basement or other remote locations, you may need additional tubing or a delivery pump depending on how far away you plan to install or if you plan to link to a refrigerator as well. 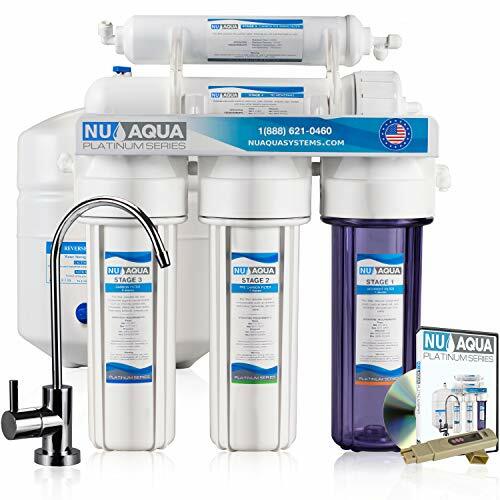 For every one gallon of water produced the system discharges between one and three gallons (depending on the pressure and quality of your incoming water).The system is compatible with 3/8" and 1/2" under sink connections. Includes filter housing wrench. Operates on 40-80 PSI water pressure, you may need a Booster Pump or Pressure Regulator depending on your water pressure.Make your water cleaner and more convenient than any pitcher, faucet filter, or countertop systems. Express Water’s 6 Stage Reverse Osmosis Ultraviolet Water Filtration System ROUV10DCG is the complete solution for your drinking water. 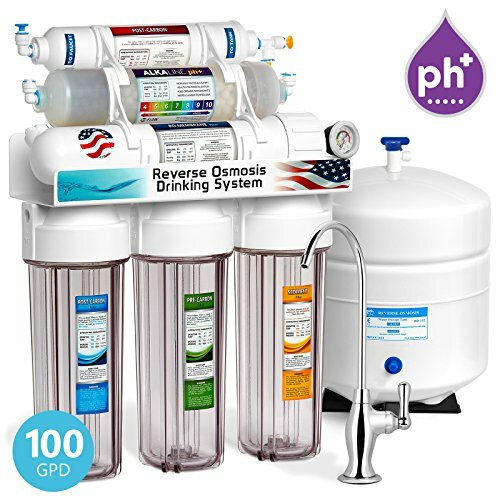 Enjoy bottled water quality, clean and great tasting water right at home for just pennies per gallon.This reverse osmosis system has a NSF Certified Membrane to produce the best quality water and to assure ultra-safe water that is contaminant free.It is the most recommended water filtration system by doctors, dietitians, and 1000’s of happy homeowners. The RCC7P-AK's booster pump makes it the most reliable option available for low pressure water sources. The reverse osmosis process is reliant on water pressure, working by pressing the source water through a semi-permeable RO membrane. If the necessary water pressure to do so is not available, the process becomes unattainable.These low water pressure situations are when the booster pump comes into play. The booster pump takes the source water and brings it up to the optimal level for the reverse osmosis process. This ensures not only that the RO process will be successful, but that you will get the absolute most out of the system in terms of efficiency and production rate. Optimal pressure to the RO membrane means more RO water can be produced and less drain water is necessary to produce said water.The system has a low pressure switch that kicks the booster pump on when the incoming water pressure reads 30 PSI+. Throughout the time the pump is operating, it turns off for a few seconds every so often to prevent itself from overheating. 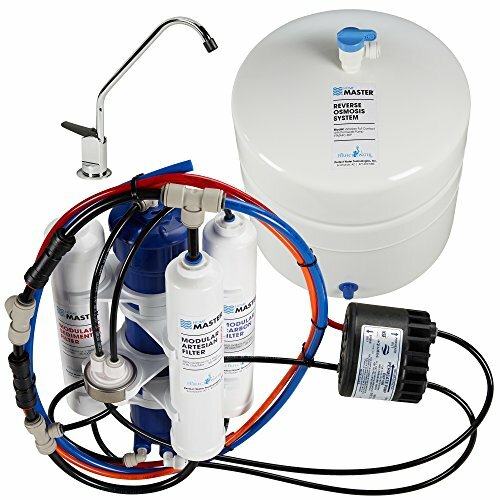 After the pressurized tank is filled with RO water, a pressure signal is sent to the high pressure switch, automatically turning the booster pump and system back off until needed again.To summarize, the RCC7P-AK takes the filtration qualities of the RCC7 and maximizes the overall functionality of the system. With the RCC7P-AK you are getting the reverse osmosis process at its absolute best in all categories - the speed of a sports car with the gas mileage of a hybrid. Based on legendary Best Seller #RCC7, featuring 11W UV Sterilization Lamp with Smart Flow Sensor Switch and Alkaline pH+ and mineral balls, this model is the most conprehensive Reverse Osmosis water filter system in the market. In response to customers' reviews about the older model of UV that is constantly on, although the feature is still very common in today's market, we do feel the pain of our customers. Therefore, we have developed a new model of transformer that features an inline Flow Sensor. Whenever you turn on drinking faucet and water starts flowing, the UV is powered on automatically to kill 99% of bacteria and viruses. It turns off automatically when water is off. It prevents a potential heat hazard and extends the life of the UV light bulb dramatically. You will enjoy the cleanest great tasting water with healthy minerals right from your tap at merely 3 cents per bottle. Protect your home, health, and appliances by filtering your water. The Express Water Sediment Water Filter removes major sediment contaminants from your water and provides clean water all home uses. This filter removes sediment contaminants like Rust, Dirt, Sand, Silt, Dust, and Scale. The Sediment filter is good for up to 6 months. This is based on average water quality. Your filter life may be different depending on your water quality, temperature, and incoming pressure. This durable filter is able to deliver up to 1 gallon of water per minute. The filter works with 45-80 psi and water temperatures between 40-100‚Ñâ. The filter is vacuum sealed and 100% pure food-grade polypropylene complete with density layering and pleated design.. Filter your water with high quality polypropylene for maximum sediment retention. Choose the filter that lasts longer to give you the best value in filtration: The Express Water Sediment Filter FLTSED0101 is the best in sediment filtration. Protect your home, health, and appliances by filtering your water. The Express Water Sediment Water Filter 50 pack removes major sediment contaminants from your water and provides clean water all home uses. This filter removes sediment contaminants like Rust, Dirt, Sand, Silt, Dust, and Scale. The Sediment filter is good for up to 6 months. This is based on average water quality. Your filter life may be different depending on your water quality, temperature, and incoming pressure. This durable filter is able to deliver up to 1 gallon of water per minute. The filter works with 45-80 psi and water temperatures between 40-100℉. The filter is vacuum sealed and 100% pure food-grade polypropylene complete with density layering and pleated design.. Filter your water with high quality polypropylene for maximum sediment retention. Choose the filter that lasts longer to give you the best value in filtration: The Express Water Sediment Filter FLTSED0150 is the best in sediment filtration. Looking for more Undersink Reverse Osmosis similar ideas? Try to explore these searches: Leather Two Piece Sectional, One Silicone, and Anne Klein Ladies Crystal. 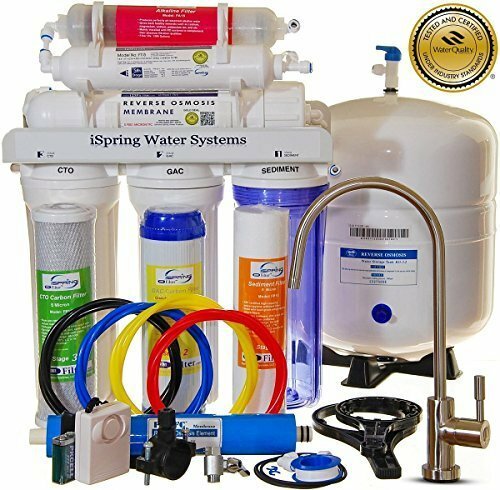 BlesDeal.com is the smartest way for online shopping: compare prices of leading online stores for best Undersink Reverse Osmosis gift ideas, Undersink Reverse Osmosis deals, and popular accessories. Don't miss TOP deals updated daily.